We hold all our catalogue items in stock. Immediately available for NEXT DAY DELIVERY! We can supply easily assembled modular display units for attractive merchandising in store. On site demonstrations available from our specially trained and experienced staff. As the main UK Warranty and Servicing Centre, we offer calibration and servicing for all laser - with express turnaround. 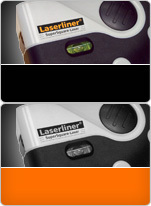 Laserliner celebrates 20 years (1993 - 2016) in the manufacture of professional tools for measuring, detection and leveling. Based in Germany, the team have developed a broad range of solutions that are both innovative and use friendly. Our early beginnings with a range of laser levels has extended to include moisture and building inspection tools, digital spirit levels, angle gauges, electrical testers and laser distance measure. All Laserliner quality German tools are covered by a no quibble 4 year warranty. Our UK sales team can arrange for a repair or replacement if a problem does occur as well as calibration & servicing if required. All professional range products also come with calibration certificates and quality certification. For more information call 0800 292 2188 and talk to one of the technical team. We're looking to expland our dealer network in the UK - please contact us or call one of our team on 0800 292 2188 to find out more. We offer unparalleled customer service and technical support as well as warranty, repair, calibration and servicing. Laserliner's UK repair and calibration centre offers a one-stop solution, with fast turnaround times.